When dressing up in your Scottish best, accent your outfit with a dagger to match! 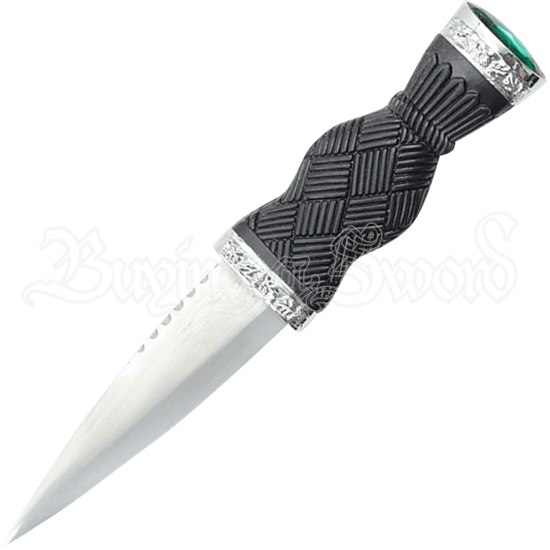 The Green Gem Cross-Hatch Sgian Dubh features a structure inspired by traditional Highlander dirks, given regal detail with its inset pommel gemstone. Made out of stainless steel, the spear point blade has light serration near the hilt and along its back edge. The black composite hilt is accented with silvery bands on its top and bottom, decorated with patterns of Scottish thistle leaves. Textured throughout with cross-hatch grooves that end just before the pommel, it is easy to get a firm grip on this historical Scottish sgian dubh. Encased by a silver tone band, the oval shaped green gemstone rests within the distinct flat pommel. A matching black composite and thistle leaf-detailed sheath comes with this jeweled Highlander dirk, making it a fine collectible and display piece as well as a must-have addition to historical Scottish reenactment ensembles.